Booked terms can be cancelled with up to 2 weeks notice before the beginning of the first class of the term and the refund will be 80% of the term. If a child does not attend a lesson due to cold/flu a refund will not be given unless a doctors note is provided. Please do not bring your child swimming if they have any of the following: Conjunctivitis, Ear infection, chicken pox, diarrhoea, impetigo, vomiting, or a very bad cold – if your child is suffering from any of the above they should be cleared by a doctor before attending our classes. Vomiting or diarrhoea should have stopped for at least 48 hours before swimming. Once a term has started then Dinkies Swim School are under no obligation to refund any classes if you wish to terminate your course with us. At Dinkies Swim School we do not offer ‘holidays or catch-up sessions’ this is due to our classes being at the lowest price we can make them all terms must be paid in full. If a pool should become unusable long term Dinkies Swim School will try to find an alternative pool however will not cover any travel costs that may occur for this, should you not wish to take the alternative pool a refund will be given. Dinkies Swim School is unable to refund any participants due to adverse weather conditions. 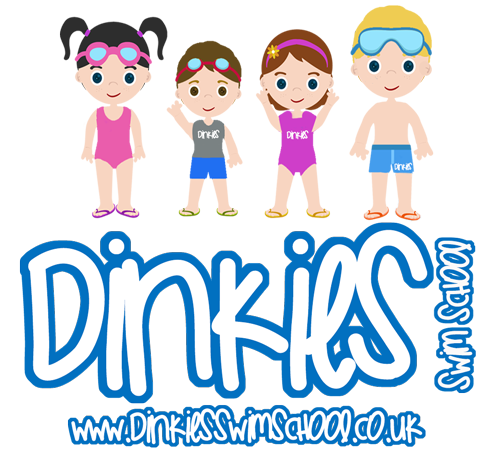 If Dinkies Swim School cancels a lesson due to a problem with the pool or teacher absence then a full refund for that lesson will be given to all participants from each lesson where the child is affected. Dinkies Swim School will give priority for future terms to all current swimmers before releasing to any new participants. Dinkies Swim School may have to merge classes as class sizes become smaller and parents return to work. We will inform you if your lesson is affected. Should you or your child have a medical condition please let us know at your earliest convenience – all information will be kept strictly confidential. Dinkies Swim School ask that all participants weather they are potty trained or not should wear two nappies, one disposable nappy and a neoprene nappy over the top. These can be purchased from us for £9 any child not wearing a neoprene nappy will be refused entry in to the lesson and a refund will not be given. Please take all nappies home with you after lessons. Please remain quiet when waiting on poolside for your lesson to begin and do not enter the pool until invited to do so by your teacher. Please remember that poolside’s are often slippy so please be sure to take care of yourself and little one whilst waiting for your lesson. Dinkies Swim School will not accept any responsibility for accidents on poolside. All adults in the pool should be 16 years plus and we can only allow one adult in the pool with one child at a time. Should you wish to take any photos of your child please do ensure that you ask permission of the teacher in the pool and always make sure only your child is in view. Please do not attempt to take any underwater photography in our lessons. All cars parked at venues and property left in a changing room or poolside is the responsibility of the owner and left at owners own risk.